Fall is in the air, and for many of our clients, it's time to plan events, focus on growth, and either attend or plan training for new members in new roles. Since we're always looking for unique stories about how different organizations use Wild Apricot, this month I turned to the Nonprofit Network, who I became aware of thanks to a LinkedIn Product Recommendation left by their Executive Director, Regina Funkhouser. They replaced 6 programs/services? It sounded intriguing. I visited their website and saw that their events and training calendar was very full...I wanted to know more about the Nonprofit Network of Jackson, Michigan, and how they were using Wild Apricot to grow their organization. Along with the cost of running all of these different systems, the frustrating thing was that each had a different set of data that had to be kept in-sync manually. "We had a membership directory on our website (#1), membership management on SBA (#2) and member emails on Constant Contact (#3) – entering data three different times. All three lists were different, and we had no idea which was correct. Changing someone’s email took an enormous amount of time. Adding an event was the same process – adding it three different places plus more than one place on our website, and inevitably, we would make a data entry error at least once. None of the systems we had was interactive, user friendly or an efficient use of our time. We had to remember to send out event announcements, we had to remember to send out invoices for membership and we had to wade through a clunky system to retrieve account information – and then enter that account information into Quickbooks (#4)." With all their frustration, the Nonprofit Network started looking for new solutions. "A very tech-savvy associate of mine suggested I look at Wild Apricot. I was explaining how frustrated I was with all of our current systems – and how labor intensive it all was. It was a great suggestion and I have thanked him many times." In March 2010, the Nonprofit Network switched over to Wild Apricot and Google Services. Combining the membership management functionality of Wild Apricot with Google-driven email and payments has helped them grow substantially. In 2009, they were providing about 8 workshops per year -- now in 2011, they will provide 80! Their membership has also grown as a result. As of March 2010, they had 100 bundled memberships, 648 contacts, and 36% of their member agencies had attended an event. Currently, they have 184 bundled memberships, 1345 contacts, and 95% of their member agencies have attended an event. That's percentage increases of 84%, 108%, and 59%, respectively -- a huge amount of growth in a short period of time! "I truly believe that our growth over the past 18 months would not have been possible if we had stayed with the above process. Wild Apricot (I’m being completely honest) was instrumental in our ability to expand our services. " The mission of Nonprofit Network is to "strengthen the governance and management of nonprofit organizations", and one of they ways they fulfill that mission is by offering affordable and accessible training. While they have always had a good process for planning events, management was more difficult. Using multiple systems to keep track of members, payments, and event registrants was time-consuming, and hosting registration for another agency's event was unthinkable. "Wild Apricot has made this process so simple for us. The automated system for emails for both events and membership has allowed us to re-focus our attention on expansion, while Wild Apricot is ensuring that basic administration is done automatically. We need to, of course, make sure that all of the automated messaging is perfect and updated, and that we have paid the appropriate attention to wording, but once we have done that -- the system takes care of everything else." While Wild Apricot can help the Nonprofit Network manage their events more efficiently, the success of those events is left to them! Regina told me that they have a number of ways of supporting their members and the community-at-large. "We survey our members after every event and ask them what they want to learn. We create our training calendar based on the needs of our members, the requests we receive and critical areas of need in our community." 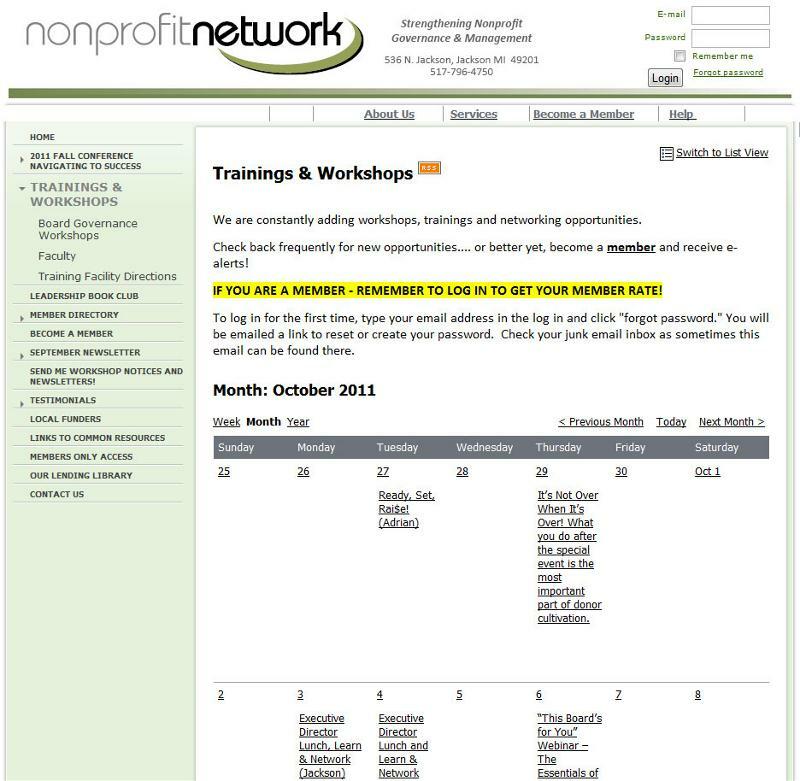 The training and workshops they offer is one of the ways the Nonprofit Network tries to attract more members. To provide value, they offer member discounts on classes, while non-members pay higher prices. They also have several other members-only benefits, including access to specialized services such a grant reviews, one-on-one technical assistance, and one hour of consulting per month. This year, the Nonprofit Network will train more than 700 people across their 80 workshops. One of their training sessions is a series of six workshops on Board Governance, which includes a mix of in-person and webinar sessions offered throughout the year. 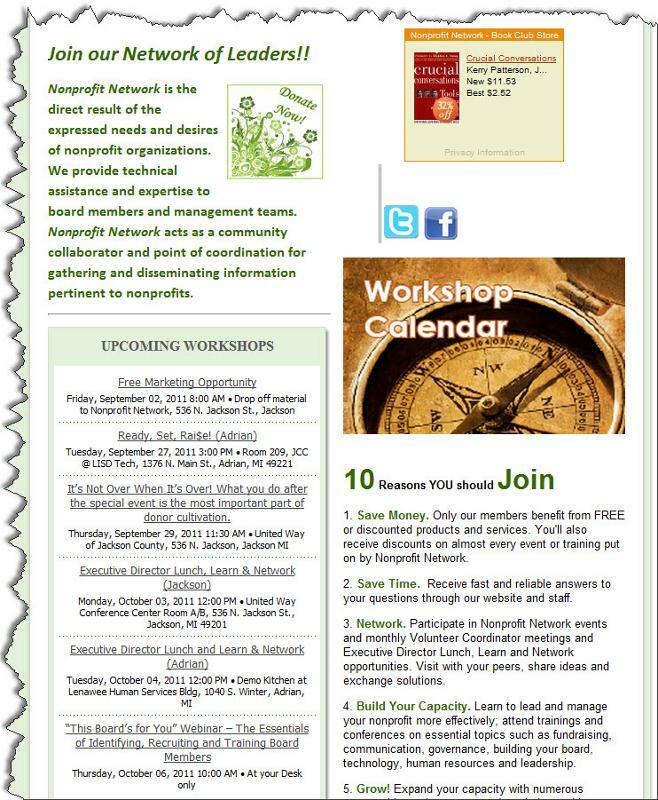 The Nonprofit Network's event calendar is packed full of different classes every week. "Some of our workshops have only 3 attendees, some have 30. Other events attract over 100 attendees -- we are expecting 180 at our Fall Conference. We provide some classes over and over again, and our attendance fluctuates dramatically. Right now, we aren't exactly sure why some are successful and why some aren't. We provide so many opportunities that we are going to be able to judge if a certain day, time, or time of month provides us with increased attendance. We are going to be looking at this data intensely in December." Whether you're a Wild Apricot client, or someone who's interested in knowing more about how to manage events in Wild Apricot, check out our webinar on Thursday, October 13 at 3:00pm Eastern Time.